The exact source of the SF 6 gas leak must be detected in order for TDS to propose a repair method. For many years, SF 6 leak detection was done using a soapy water like Snoop, hand held gas detectors, or ultrasonic devices. These detectors were adequate however extraneous factors could interfere with their capability. Factors such as wind, noise, or the thoroughness of the leak detection survey sometimes render these detectors unreliable. 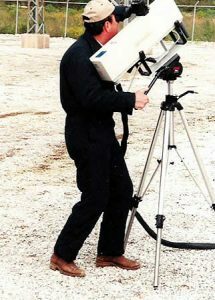 The new device that has proved very useful for detecting SF 6 leaks is the infrared laser-scanning unit. This detector scans the entire circuit breaker using a laser and detects the specific infrared signature of SF 6 gas. The SF 6 leak appears as black smoke on the video used to record the scan. 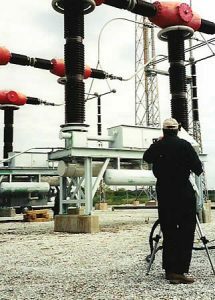 Figures 1 and 2 (below) show a technician using one of these devices. TDS can provide this service upon request or utilities will provide copies of video for our analysis. Viewing the tapes makes it quite easy to see the exact component that has failed. With this information, TDS is able to generate a quotation for the customer. TDS has a business partner that does an excellent job of SF 6 Leak Detection throughout the United States. That Company is Equipment Imaging and Solutions, Inc.